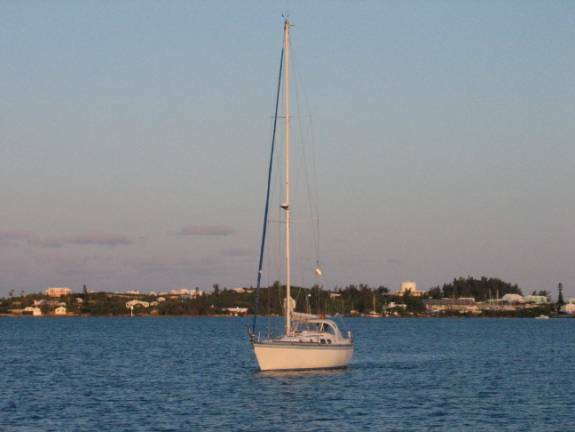 The Plan: We planned to sail directly from Charleston to the Azores, bypassing Bermuda. The Pilot Charts (100 years of weather data summarized by month) indicated we should have following winds 98% of the time and make the trip in 21 days. 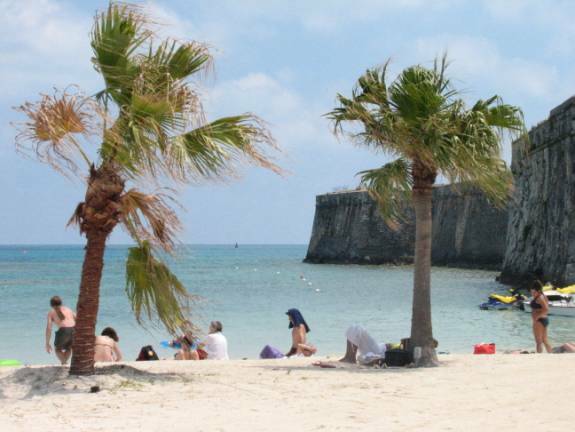 However, the day we left Bermuda a major weather system was developing (later became the first named storm of the season: Andrea) and we were forced south. 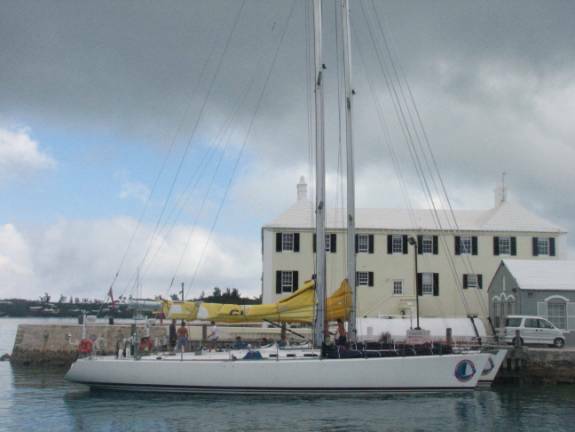 A week after we left Charleston, far off our great circle route to the Azores, we took refuge in Bermuda for a rest and refueling. Two weeks later, our weather router (Herb Hilgenberg, a retired meteorologist who used marine Single Sideband Radio (SSB) to communicate weather data and routing advice to sailors in the Atlantic) gave us the “thumbs up” to leave for the Azores, only to send us about 250 miles south to avoid bad weather. 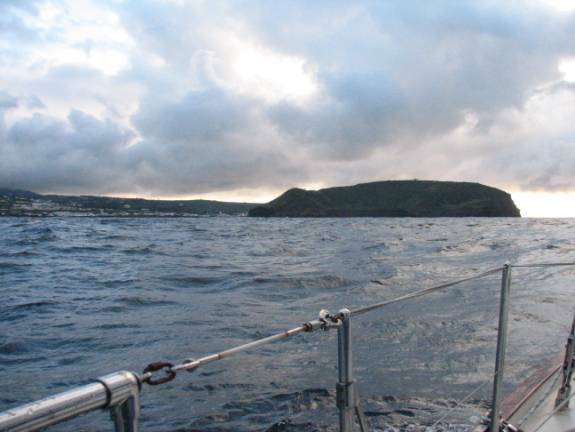 Once again we went well off the Great Circle Route to avoid weather and took 22 days at sea to land in Horta, the Azores. Shortly we will leave on the third leg of our Atlantic crossing for Crosshaven, Republic of Ireland (near Cork). We are hoping the third leg will be the charm. Charleston to Bermuda: As we left Charleston, we offered Neptune a “wee dram” of Macallan Single Malt to ensure a fair passage. We guess the 12-year-old was not to his liking, since the passage was far from smooth. Jane offering libation to Neptune. 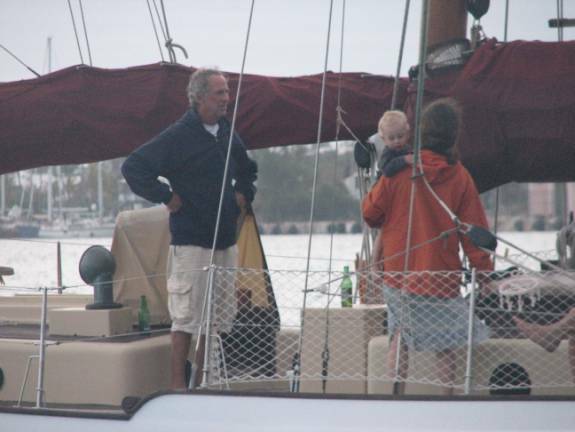 Although we had gotten the “OK” from Herb the day before we left, once out from harbour the story was less rosy. He had us change from an easterly direction to southeast to avoid a major low-pressure system that was developing. 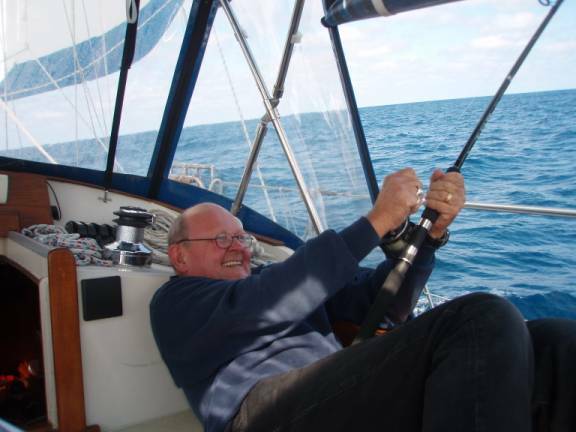 We had good wind and were very pleased with our wind-driven self-steering unit at keeping us on course. Each day we continued to check in with Herb, and we continued to get advice to go southeast. We were well off our Great Circle Route to the Azores. 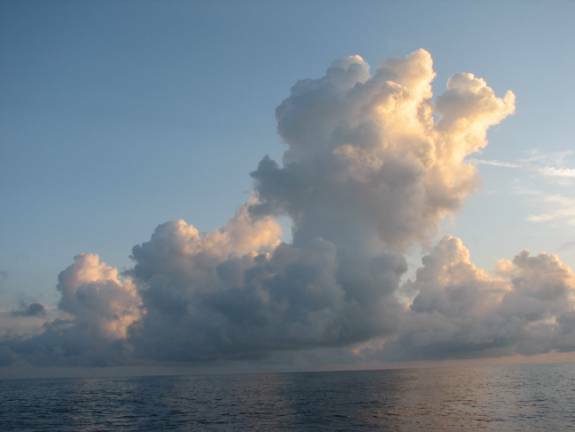 The towering cumulus clouds gave warning of turbulent weather developing. However, a small barn sparrow found us, and hitched a ride. S/he tried a few trial runs off the boat, but came back after every attempt. We figure the bird thought our “barn” very strange with no straw and no animals. S/he did not survive, but at least we kept the bird from a watery grave. 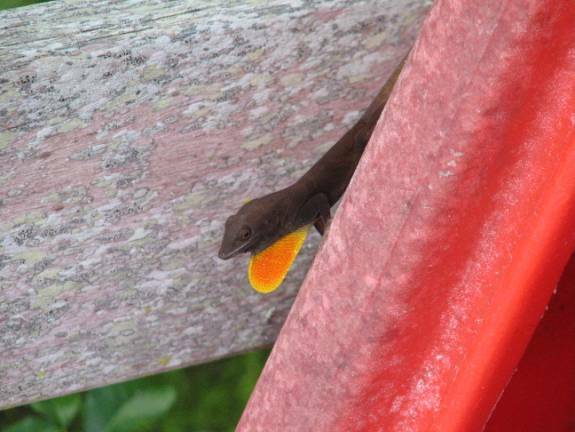 In addition to the swallow, we had flying fish and squid land on our deck, providing both stench and black ink spots. 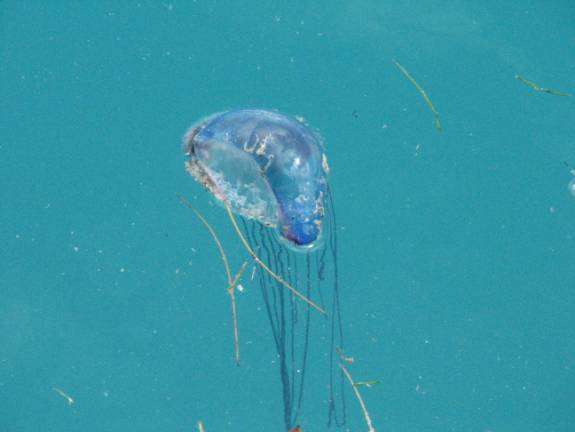 We also saw many Portuguese Man-o’-War jellyfish. 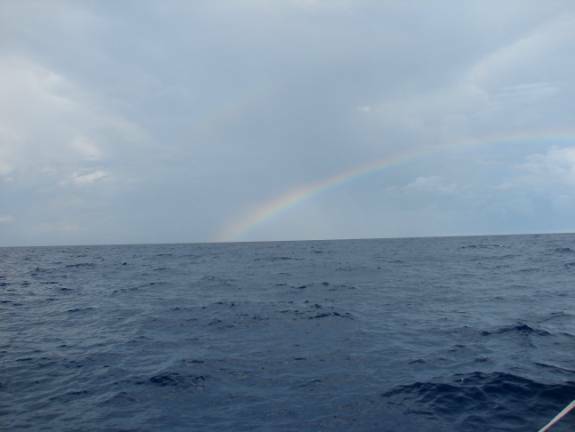 On Monday, May 7 we heard that Flying Colours, a sailboat larger than Pilgrim, had sent out an emergency distress signal just 100 miles from our previous-day’s position. The boat and its 4 crew were never found. The storm was that close to us. 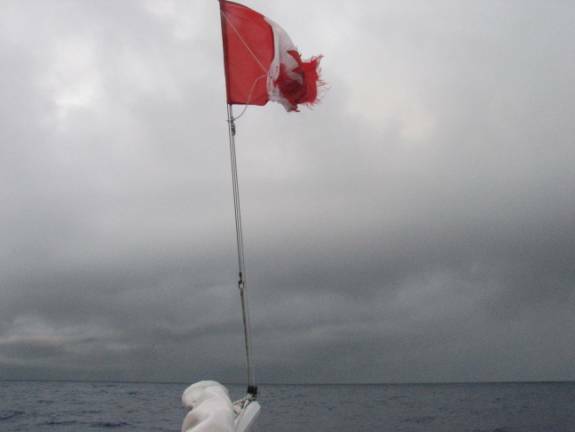 We motor-sailed much of the 8-day passage, trying to out-run the storm, then coping with the 15-foot seas that radiated from the storm centre. 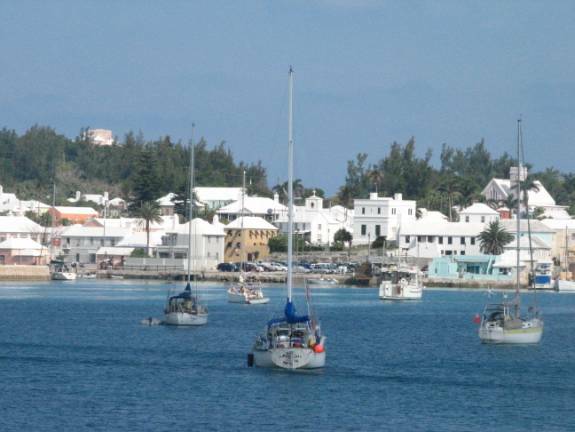 It was a relief to drop anchor in St. George’s Harbour in Bermuda 8 days after leaving Charleston. The mileage from Charleston to Bermuda is 775 miles; we sailed 1025 to get there because of the storm detour. 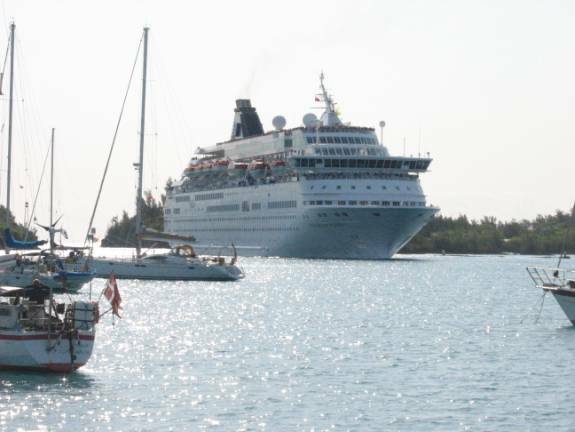 Bermuda: Since we had used half of our fuel getting to Bermuda, we had no choice but to stop to refuel, make some repairs, and rest ourselves. 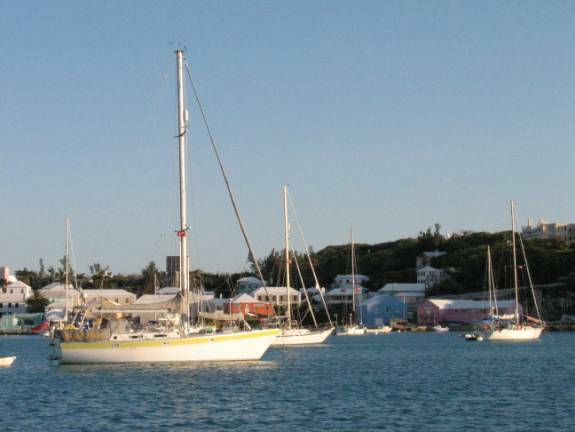 We spent the two weeks at anchor, taking the dinghy ashore for shopping, laundry, and sightseeing. 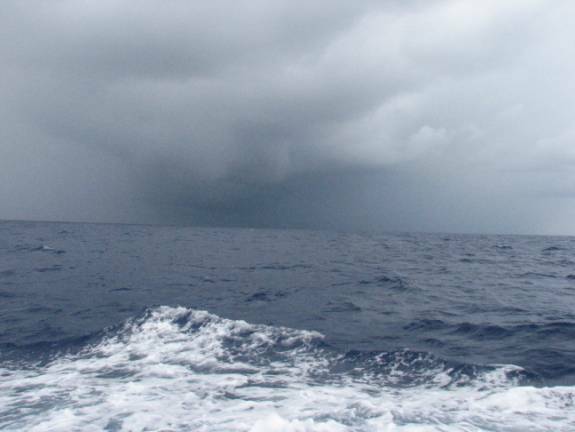 During our stay there were two major storms; Bermuda seems to attract low-pressure systems. 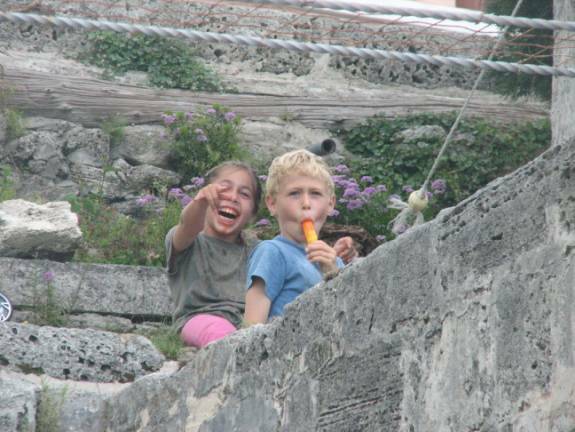 And children know how to have fun. 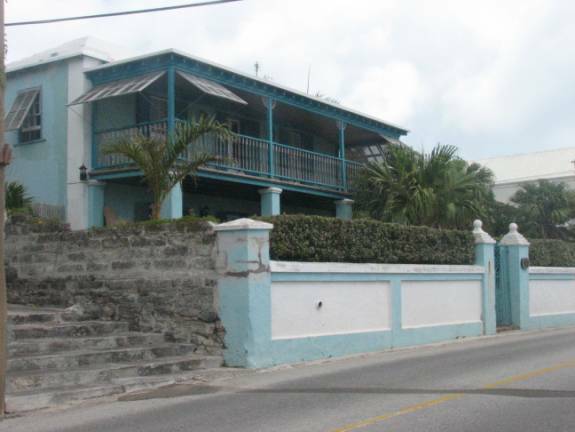 Houses are stucco, usually painted in vivid pastel colours. The Anglican church has lovely grounds and an old cemetery. 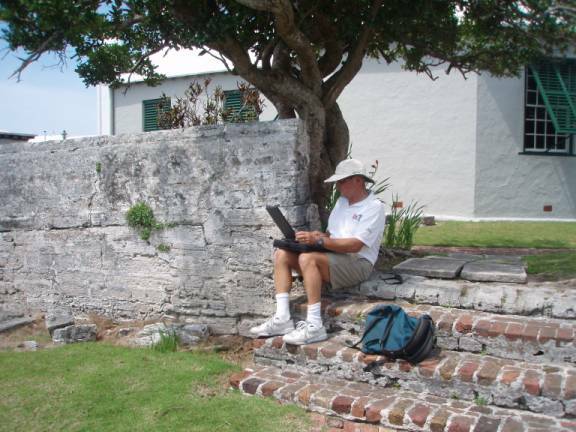 Brian looking for a free WI-FI access point. 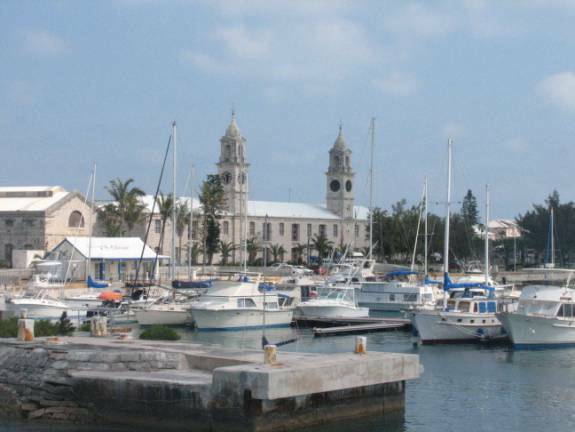 We went to the capital city Hamilton via the high-speed ferry to Docklands, the former site of the naval docks on the NW tip of Bermuda and then by bus to the city. 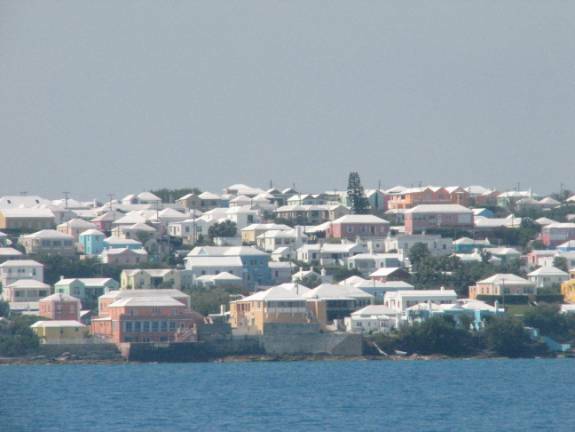 The entire island is built up with housing, most is one or two stories tall, and stucco painted in vivid colours. 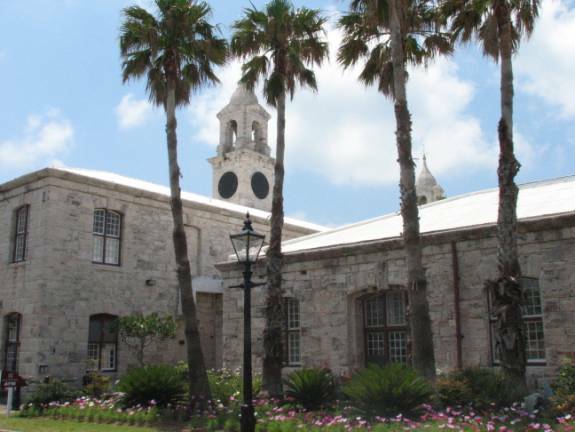 The naval yards are no longer being used by the navy, but have become a most attractive tourist attraction, with a maritime museum, art galleries, craft shops and restaurants. 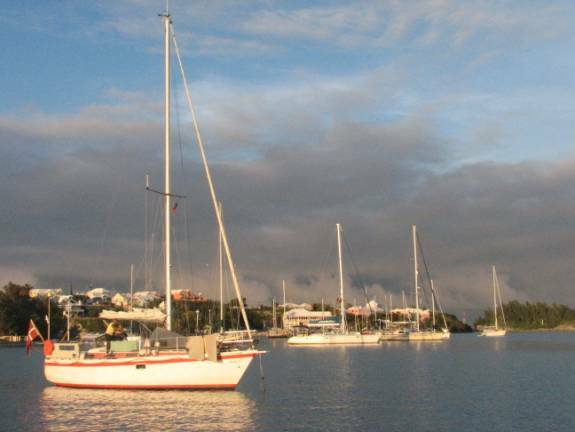 In Docklands there is a small beach with a coral reef within wading distance of the shore. Brian and Richard (a single-hander from the UK) snorkeled and found many different kinds of fish and coral; it was well worth the stop. After the swim we took a public transportation bus to Hamilton. 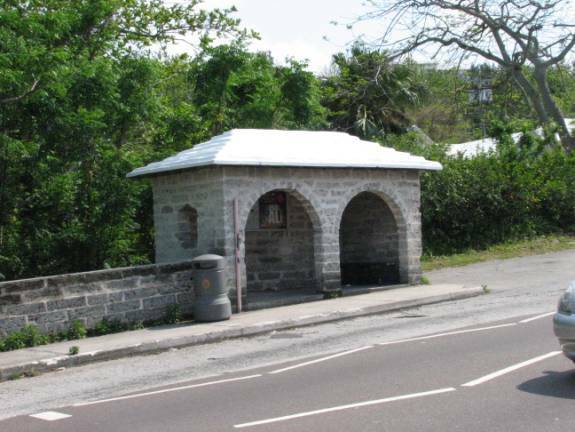 It took us along the west and southwest coast of the island. The reefs and the water colours were beautiful. So was the vegetation. The island is a garden gone wild. 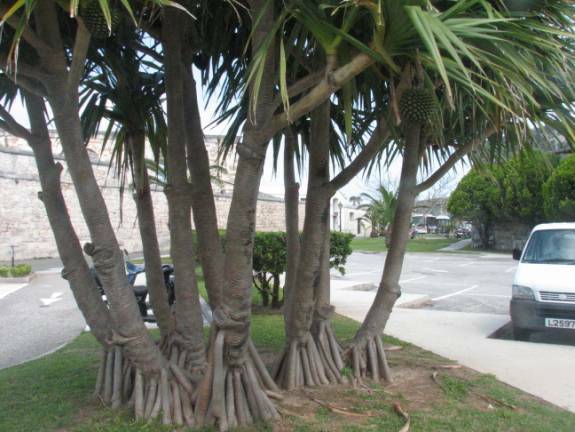 There is a wide assortment of palms, including the intriguing screw palm that seems to have lots of support roots where the trunk meets the ground. There are cacti, especially prickly pear. So many colours of hibiscus, sometimes in large hedges. Easter lilies wild along the roadside. Morning glory vines with bright blue flowers grew in everything. 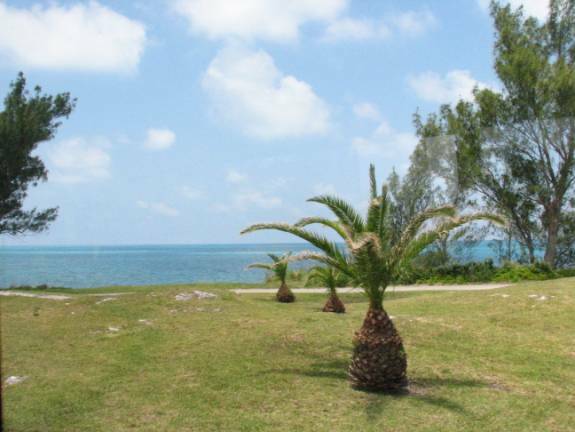 Australian pine (Cassauria) that we saw in the Bahamas, which is fast-growing, but short-lived. 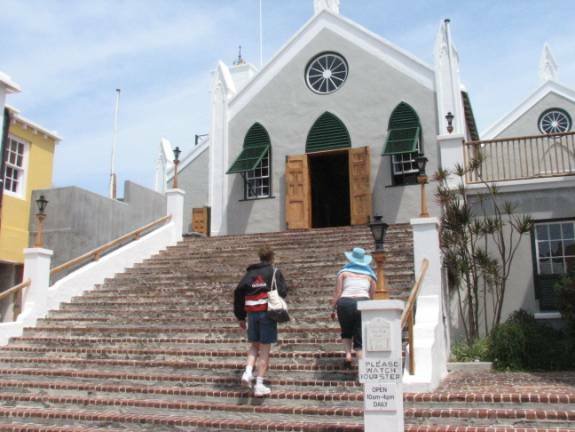 The island is lush and beautiful, especially with the colourful houses with white tiled roofs that have been stuccoed, and then whitewashed. The ride itself was thrilling. 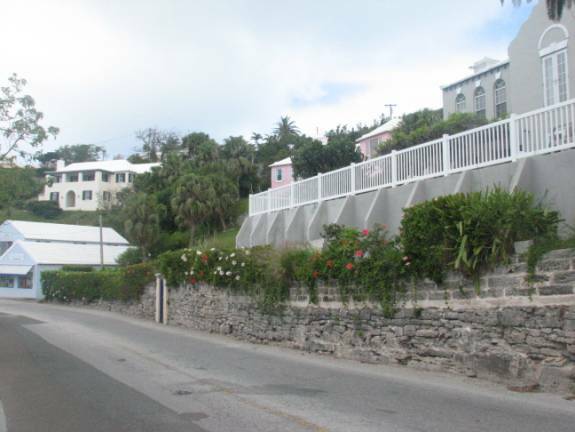 Up and down hills with hairpin turns and narrow roads. The hills are not really that big, but there are lots of ups and downs. Hamilton is picturesque with brightly painted buildings and a traffic cop stationed in the middle of the road. 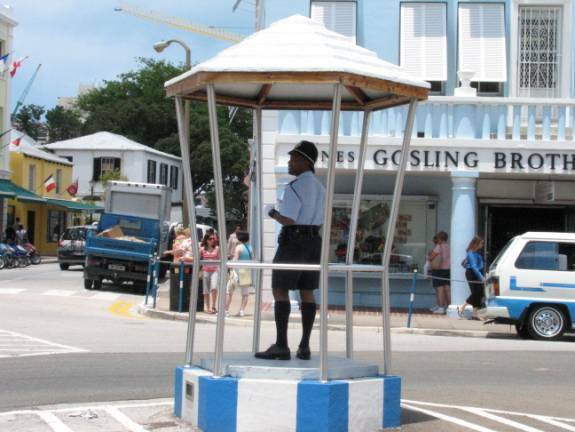 We were looking for a place to eat when we stumbled into the Royal Bermuda Yacht Club. It is a very pretty club, but not nearly as large and imposing as the Royal Canadian Yacht Club, and there was no hesitation seating us… they did not even ask to see a yacht club membership card. 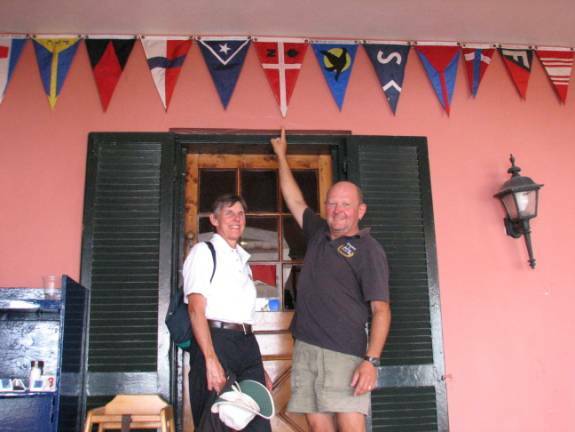 We found a National Yacht Club burgee on the wall, the only Canadian burgee in their collection. We left Hamilton and took a bus back toward St. George. There is very little agricultural space but we did see one small onion farm. 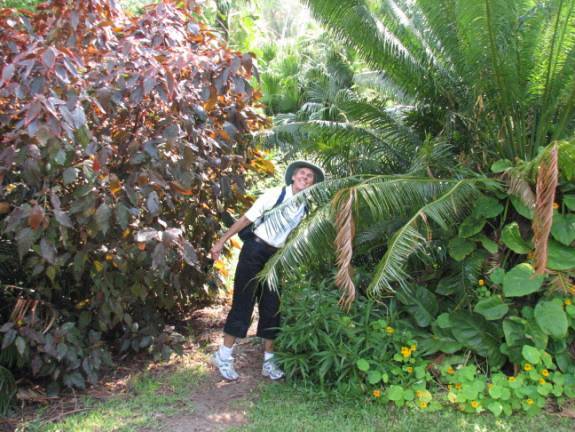 We visited a small public park called Tom Moore’s Jungle. It was a magnificent tangle of all sorts of trees, bushes and vines. 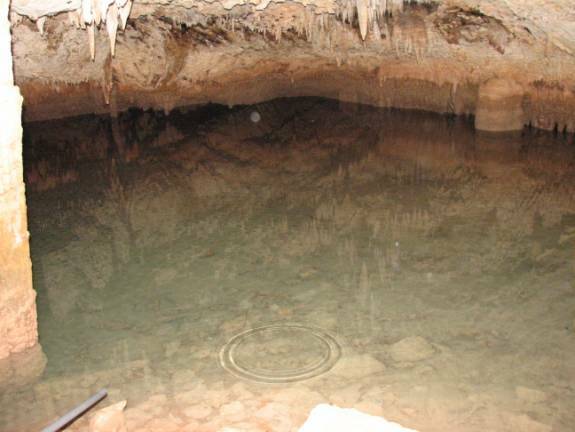 It had calabash trees, chickens and roosters running about, and a cave with stalactites and stalagmites. 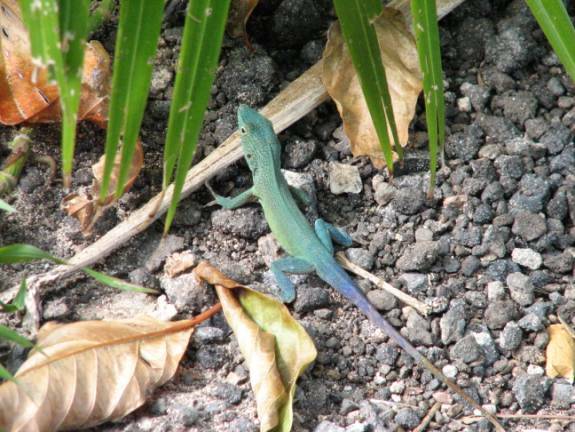 and several lizards, including a brilliant blue and green chameleon. We were the only ones in the park … a real gem. 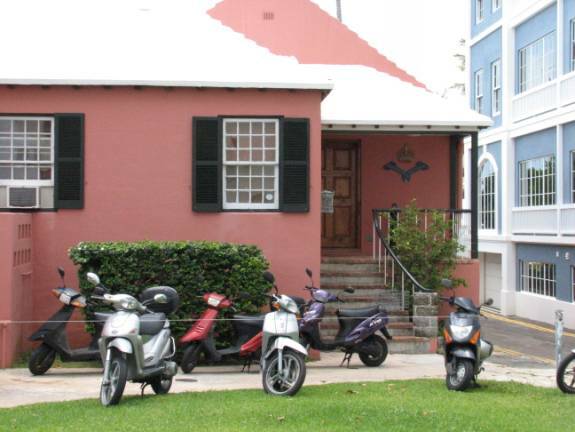 We formed the Bermuda / Azores Rally Network … founded in the White Horse Bar in Bermuda. We met and set a schedule of contacting each other via marine SSB during the passage. It was comforting to know other cruisers would be within radio range, if not visual range. As the passage gave us weather, equipment and communication challenges, the camaraderie our informal rally provided helped us meet the challenges. 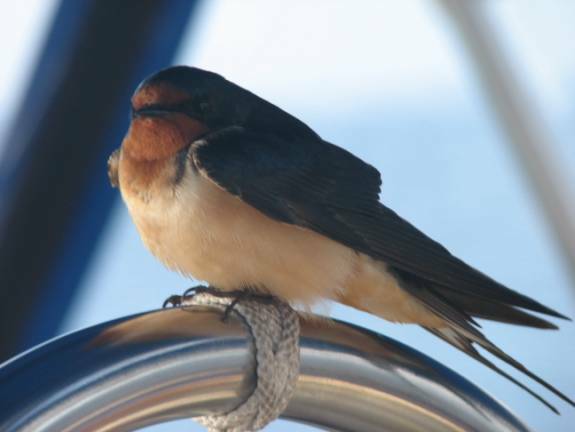 Bermuda to the Azores: We left the Azores at dawn on Friday, May 25 with Lizzie Bee and Chardonnay II. Our first check-in with Herb brought bad weather news. A low was developing and it was impossible to determine its eventual path. Herb gave us two options: First was to go North as quickly as possible, but since Herb was not sure how this low would develop, with this option we may have been forced to go west to avoid gale force winds. Second option was to go SE, and catch the SW winds from the low as it passed NW of us. We decided to go with the southeast option after consultation with the other boats in our little fleet. Over the next three days Herb had us going south, as far south as 28 degrees, 30 minutes N. The theory was that as soon as the wind veered from east to south, we could stop going south and begin our trek east and north. However, the low did not take the course Herb predicted, and we ended up in 25 knot SE winds on the nose for three days before we could venture north. During this time two more boats (stragglers from the ARC rally), Rosario and Stella Maris, joined our informal BARNET. 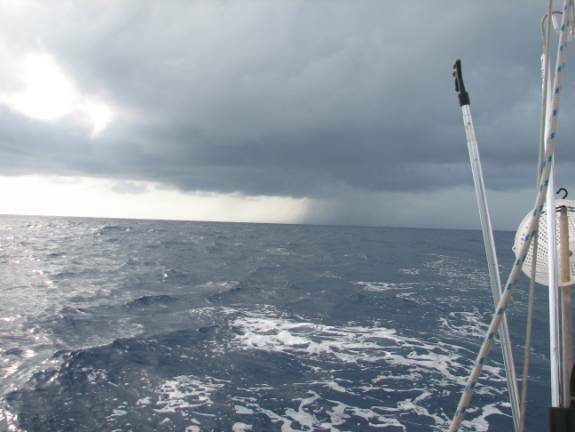 We spent the first week trying to get out of the storm’s way and making little progress toward the Azores. This was not fun. On the third morning we went through one rainsquall after another, our cockpit enclosure leaking profusely. When we needed to adjust the Genoa sheets and open the side enclosure panels, we always got a blast of spray in our faces. We went through two sets of clothing. Everything onboard was damp and salty. 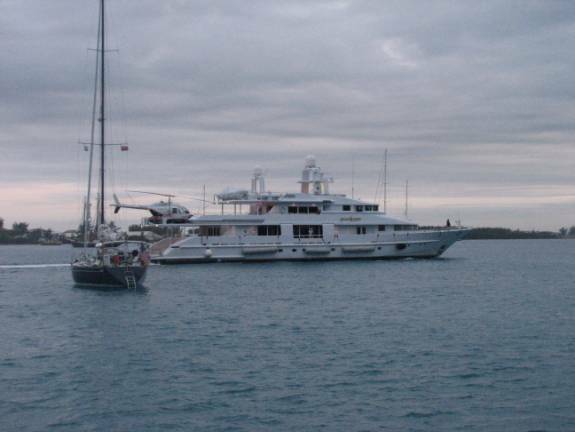 We stayed close to Chardonnay II since Thor blew his marine SSB radio in Bermuda, and his VHF radio also stopped working. When we lost radio contact with him, we sent e-mails to his wife in Toronto with our positions, Herb’s analysis and weather data. She could telephone him (satellite phone) and relay the data. Richard, single-handing Lizzy Bee lost use of his self-steering during the storm and had to hand-steer through the night with deluges of rain. His cockpit has a dodger, but that was his only protection from the rain and wind. The next day he was able to develop a temporary solution for the problem. Chris, who has two friends helping him on Sarah Grace had to climb to the top of his mast three times to repair his jib halyard. 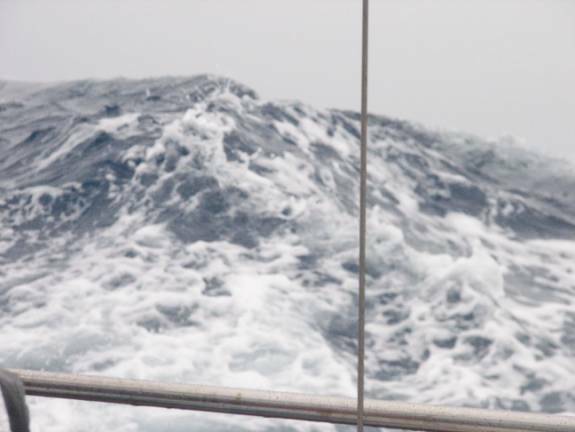 He has mast steps, but in the large swells, I sure would not have wanted to go up. After 3 days of storm we finally emerged from the extensive low that gave us such bad weather. Although there were still large waves, the wind calmed and the sun came out. We delighted in having a shower. Brian sat absolutely bare in the sun in the cockpit and felt like a kitten in a sunbeam. Pilgrim suffered some damage during the storm. We were pounding into large waves and one striped off the teak lattice “floor” on our bow pulpit. Brian found half of it under the staysail that was lashed on the foredeck. We have added more lash-down lines on the dinghy and feel that it is more than secure now. We have had a constant nagging problem with our hydraulic steering every since May 2005 when Alex (who did repairs on Pilgrim the winter of 2005) broke one of the lines. We have to pump up the pressure every couple of weeks and even add fluid. Finally the leak (a faulty clamp) gushed forth and suddenly the only steering we had was our wind-powered self-steering. Fortunately Brian was able to find and fix the problem quickly, but it entailed clearing everything out of the engine room, not easy in these seas. Brian trailed a fishing line on our calmer days. Although we did not catch a fish during the crossing, a Shearwater (bird) picked up the lure and Brian was able to shake it off without harming it. Another time there was a light tug on the line; by the time Brian took the rod out of the holder and moved to the aft deck, a bigger fish has chomped down on the smaller one, and took all 300 yards of 100 pound test line off the rod. With the first week of stormy weather that took us way off course, we finally settled down to reasonable sailing for the last two weeks. We enjoyed some beautiful sunsets. On June 3 a cargo ship in our area had a medical emergency and made on call on VHF Channel 16 for any vessel with a doctor onboard. 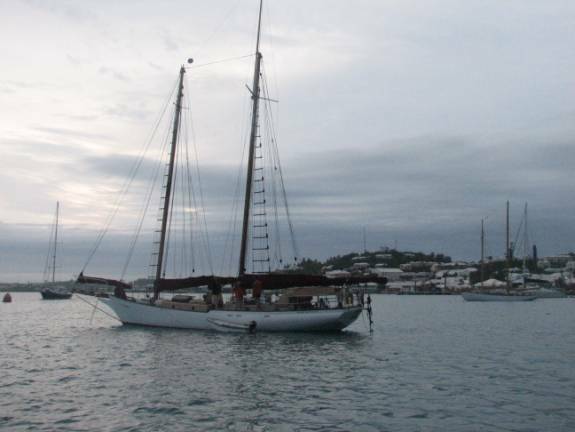 Patronne heard the call and answered that another boat in the area, Sarah Grace, had a doctor onboard. We (on Pilgrim) then heard the freighter calling Sarah Grace as the commercial boat approached our area, but we could not hear Sarah Grace’s response. This is the story: the chief engineer on the freighter was a good friend of the captain’s, and the engineer suddenly died. The captain refused to believe his friend had died, and if he had, they needed a death certificate. Chris responded and the ship rendezvoused with Sarah Grace. The ship dropped its lifeboat over its rail, and Chris maneuvered Sarah Grace to the lifeboat, it acting as a fender between the two boats. Then Chris went aboard, found the engineer was dead and completed the paperwork. The captain asked Chris if there was anything he could do for Sarah Grace. Chris asked if they could have some additional diesel, which the ship transferred to Chris’ boat, along with a bottle of Scotch whisky. Chris reported that getting away from the freighter was much more difficult that the approach. The boat offered a lee shore, which kept drawing Chris’ small boat into it. 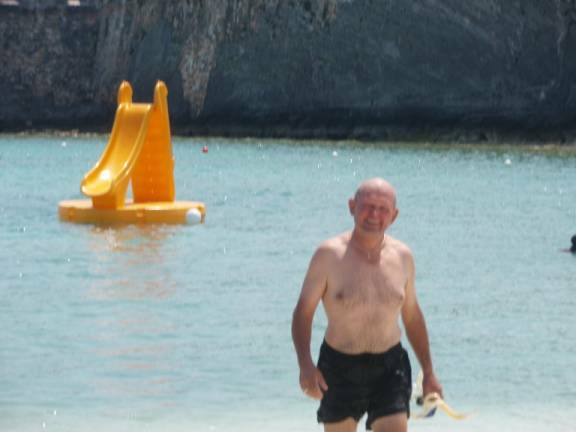 If the conditions had been windier, Chris doubts he could have pulled away from the big boat. The second incident involves Chardonnay II. 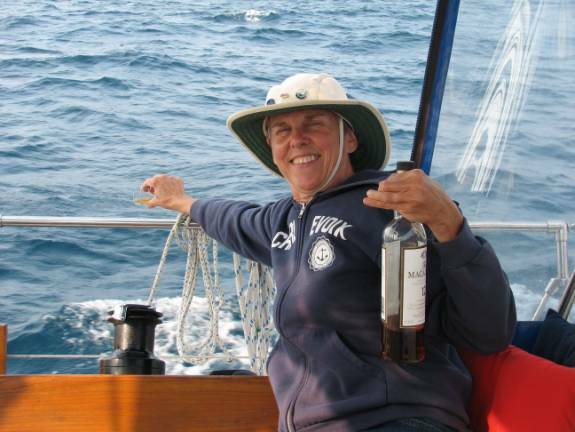 There was an emergency broadcast at the beginning of Herb’s broadcast that Chardonnay II had lost the use of its rudder and needed assistance. Chardonnay II was about 130 miles southwest of our current position. Thor had diving gear and parts to make the repair, but wanted at least one other person to assist him going over into the water alone. We immediately knew one or more of us who had started out with Thor would have to return to help. Our main issue was fuel. We had used half of our fuel, and if we needed to use more to help assist Chardonnay II, we may not have enough to get to the Azores. Lizzie Bee was a single-hander, so would have difficulty providing assistance without leaving his own boat in jeopardy. Sarah Grace was the furthest ahead, therefore the greatest distance from Chardonnay II (but did have full fuel tanks and 3 persons on board). We were prepared to alter course, but decided to wait until Chris (who has a satellite phone) had an opportunity to talk with either Thor or his wife (in Toronto) to find out exactly the nature of assistance required. 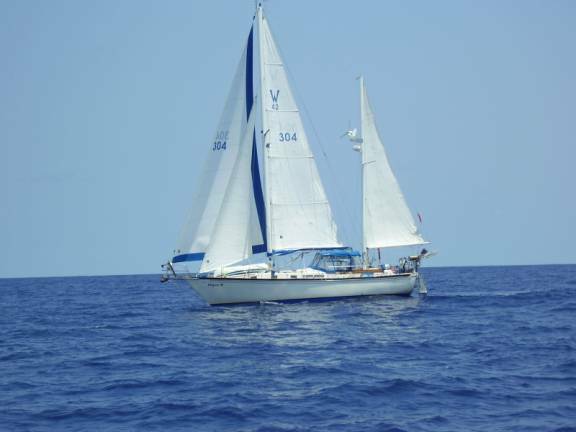 In the meantime, another boat, Triumph, a 65-foot sloop with 5 people on board, called in on our marine SSB channel and indicated they were closest to Thor and it was not greatly out of their way to offer assistance. What a relief. Later, during our nightly evening SSB network call, Chris informed us that he had talked to Thor, and Thor had made the repair and was now underway! We are relieved we do not have to turn back, but there was never a doubt we would have it the other solutions were not found. After the storm there was one morning with a light breeze under 5 knots; we hauled out our asymmetrical spinnaker and drifted along with if for the morning. 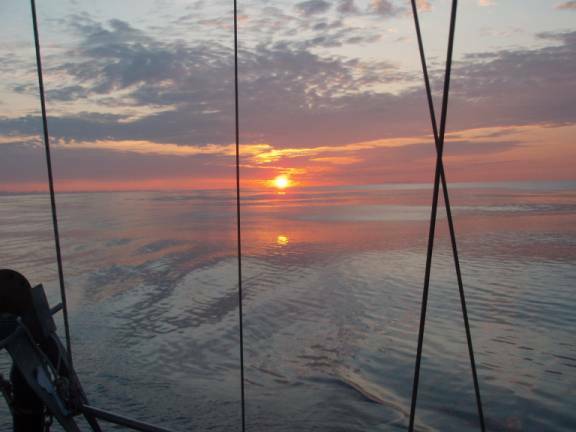 We also started sailing with both headsails (Genoa and Staysail) and the Mizzen, along with the Main. 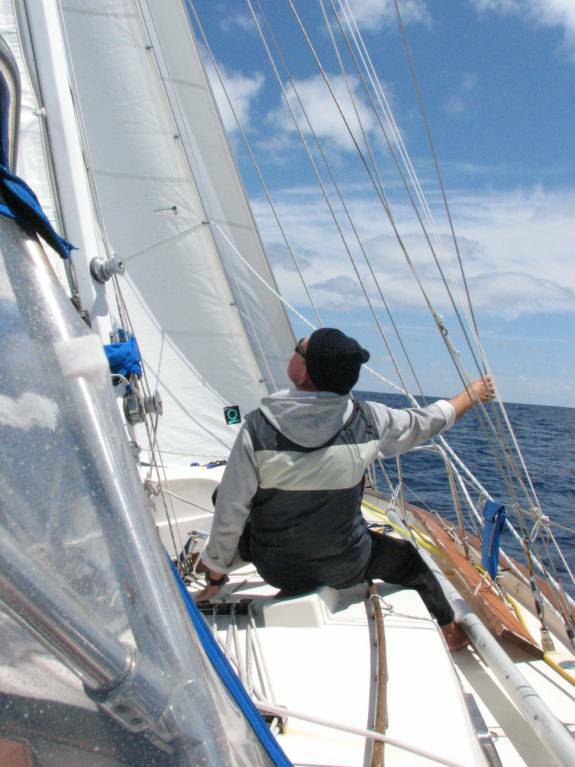 The “slot” of the double headsail worked well for us on close reaches. Life aboard Pilgrim during the crossing was very different from cruising and has two very different flavours: Stormy and Calm. 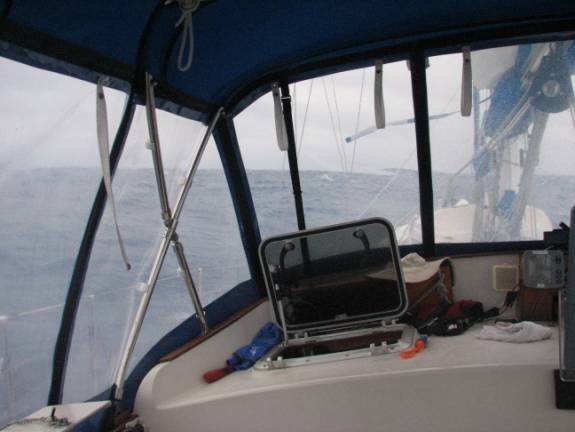 When we were experiencing strong winds and big waves, it is a struggle to move about the boat, even from one side of the cockpit to another. We moved as little as necessary and meals become snacks. Work in the galley was a struggle. The plates and pots & pans storage areas became a jumble and nothing fit into its original space. The “spice rack” above the refrigerator was a huge challenge. If you wanted to get out a jar on the leeward end of the rack, all the jars above it will come crashing into its spot, and it is not easy to keep balance, hold the jar to be returned, and push all the jars that slid down to accommodate the used jar. We were very aware of the dangers of hot pots slipping off the stove even with its gimbling. Order in the fridge was gone despite the use of boxes to keep like items together. The concept of using a drainboard when washing dishes was ludicrous. Washing and taking out contact lenses were also a challenge. The water coming out of the tap follows the laws of gravity, which means it may not “drop” into the sink. Same with the lenses. Water does not necessarily flow down the drain. Everything was wet with saltwater. On calm evenings there was heavy saltwater hanging in the air. You could taste it. We discovered leaks through the dorades during rain and heavy spray. During calm, sunny days we hung cloths out on the lifelines and the clothesline in the cockpit trying to get them dry before wearing or putting them in the laundry. 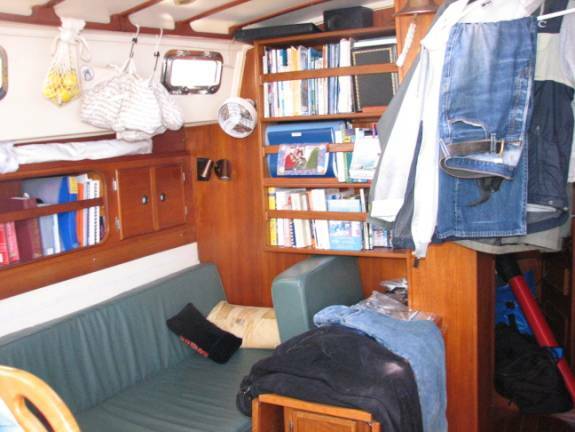 The V-Berth was a disaster with everything that was on a berth jumbled together on the floor and wet from a small leak on the starboard side. On the animal front, we saw several sea turtles while we were still in tropical waters. 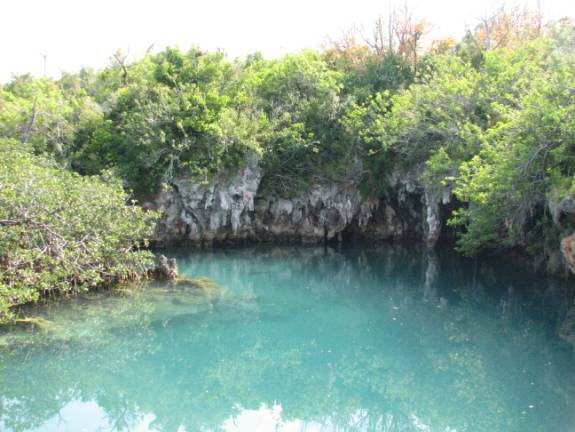 They have light brown and ivory shells, and just seem to be floating along on the water. One turtle was floating right next to a good size tree. We also encountered large schools of dolphins, some with over 50 animals. The striped dolphins are larger than the bottlenose, dark on top, white on the belly with a stripe between. They swam around and under Pilgrim, then swam away jumping clear out of the water. A Marineland show without the hoops (and hoopla). During one of the net sessions Chris mentioned that they were in churning and upwelling water due to the Gulf Stream. The next afternoon a similar disturbance occurred beside Pilgrim. The difference being that this one was moving in a straight line under the boat. Five boat lengths from the bow a tail fluke appeared from a rather large whale. It seems that we were in the way and it was easier for the whale to dive under than go around. 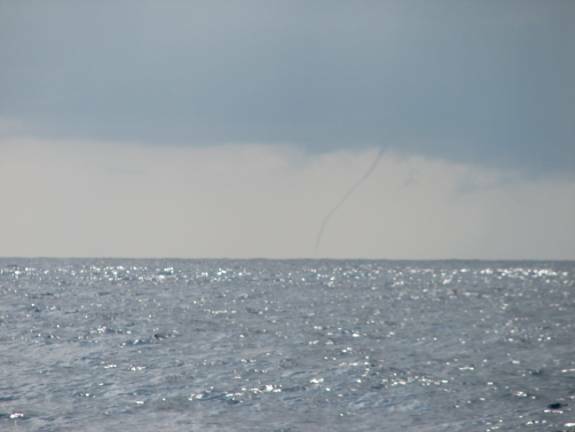 The churning water was caused by the motion of the tail. After that we decided to keep our depth sounder on to let whales know that we were around. We also saw Storm Petrels joining the Shearwaters in the sky. The Storm Petrel is quite small, black and white and has a very fast wing beat. It does not act like a water bird; so far we have not seen one land in the water. The Shearwaters are so graceful, play the wind with long soaring stretches, and glide right into the trough of waves. It is a wonder they are not pooped by the waves occasionally. One night the there was little wind and the water was quite smooth. Brian shone the big flashlight into the ocean, and we were both amazed to see the life teaming below the surface. There were a number of tiny fish and animals and/or algae that looked like bugs. There were also long, narrow fish with iridescent patches along their bodies. The first week was difficult battling the storm, but the second and third weeks provided good sailing. The last three days we had 25+ knots of wind, but on a broad reach (wind from behind) rather than on our nose. 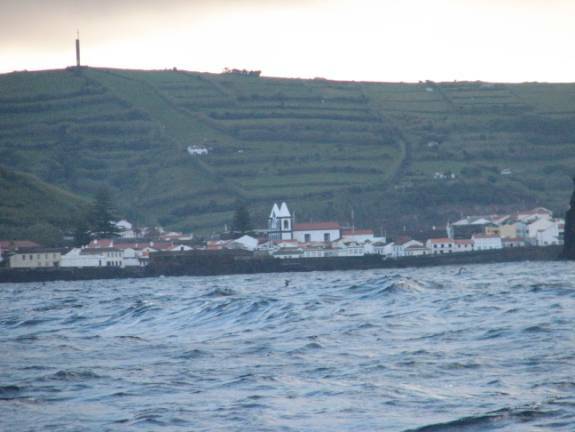 We finally came into sight of Faial on Saturday morning, June 16. 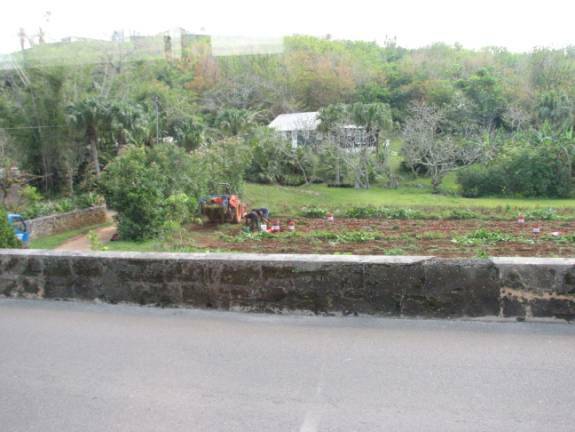 Even in the rain it is a beautiful island, with terraced fields, steep cliffs, and lush green. We have so much to learn about cruising in Europe. Boats raft off other boats that are tied to docks or walls without getting agreement from the boat owner to which they are tying. Once we understood the boat culture, we rafted, then cleared customs and immigration and were given a spot / boat off which we could raft. It took 24 hours to get rested. 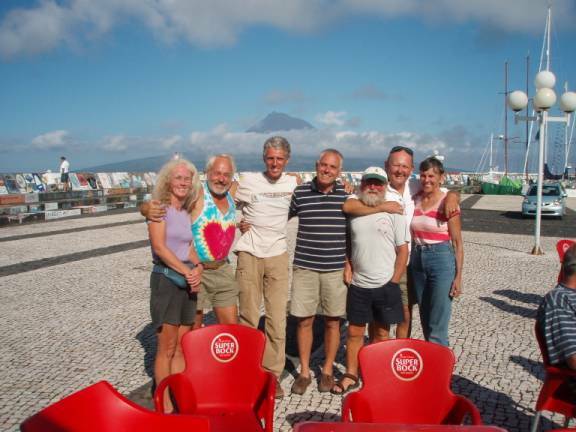 Then all of us in the BARNET got together to determine the winner of the “rally” from Bermuda to the Azores. We gathered on the largest boat, Chardonnay II, and had a great party, each boat awarding penalty points to other boats and bonus points to themselves to determine the winning boat. We all considered ourselves winners to have landed in Horta with no major damage or injury. 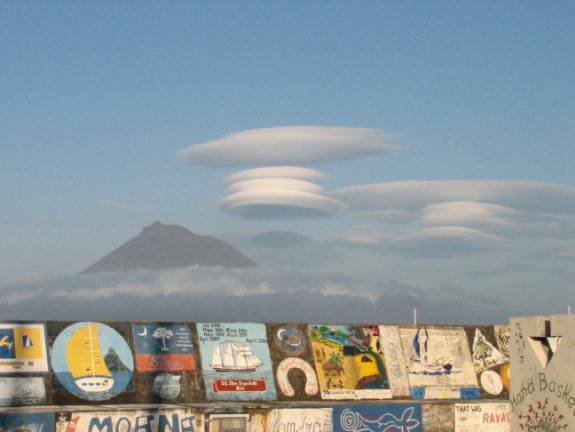 Our next log (to be prepared after we arrive in Ireland in late July) will give you stories and pictures of our stay in the Azores, which has been suburb.